ACTEX speaks with the author, Sam Broverman. Sam Broverman has been helping students pass actuarial exams since he began teaching in 1978. He is a full professor of Actuarial Mathematics at the University of Toronto, where he has taught since 1980. In addition to his ASA designation, Broverman holds a PhD in Mathematics. He is the author of numerous study guides and the textbook, Mathematics of Investment and Credit, an Exam FM official reference. Broverman has taught actuarial courses in Hong Kong, Mainland China, Mexico, and Europe and has served as a development committee member and an instructor for the "common core" portion of the SOA Course 7 seminar in applied modeling. 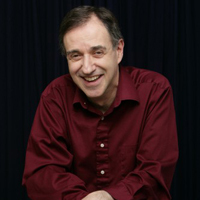 When he is not pondering risk management topics, Sam Broverman sings professionally with an emphasis on jazz and American songbook standards. ACTEX Learning AL: What draws you to write? Sam Broverman (SB): Early in my academic career, I would use established textbooks for the courses that I was teaching. As I gained experience as a teacher, I began to develop my own notes and approaches to teaching various subjects. At some point, I felt that it would be useful to me, and perhaps to others, if I "formalized" my teaching materials into textbook or study guide form. It was gratifying to start seeing others use my books and study guides in their courses and studies, and I continued to write. AL: What is your creative process like? How do you stay focused? SB: Writing a textbook or study guide is a very large challenge. It requires a great deal of preparation. I begin by organizing topics and material in a logical and coherent order. I then write an outline of each section and what I would like to cover in each section along with example ideas and exercise ideas. I search through references to collect background on concepts and potential detail to include. AL: Tell us a little bit about your hobbies (outside of actuarial science). SB: My main hobby (more than a hobby, as I once earned a fair amount of money at it, and still earn a little) is singing. I have worked as a professional singer and musician since I was an undergrad and grad student studying math at college. I currently sing professionally, mostly in Toronto, but I have performed in New York and various cities in Canada and in Hong Kong. I have recorded two albums of jazz standards, and I will have an album of math parody songs available later in the summer. Information on my musical endeavors can be found at my website www.brovermusic.com. AL: What advice do you have for other aspiring authors / teachers? SB: If you feel you have developed material or an approach to a subject that has been effective, then you might consider recording it in the form of a book or notes or even video. I began my teaching career in high school, tutoring students in junior-high and high school math. That experience was very valuable to me when I began a professional career as a teacher. That experience helped me understand how to help students deal with the difficulties that they had with elementary math concepts. It is possible to become impatient with someone who is having difficulty with concepts that you regard as very easy. I was very good at math and the experience teaching basic math in high school helped me gain patience with explaining and breaking down what I regarded as elementary concepts into even smaller pieces that the students would be able grasp. AL: Tell us about the cover and how it came about. SB: I can't remember. 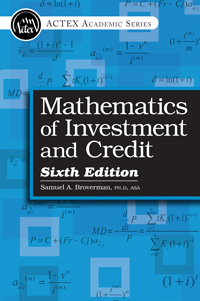 I think I wanted some actuarial symbols on the cover and it has evolved into what it is now. AL: What was your favorite non-actuarial class in college? SB: I took music courses and lessons while studying math. I also took a theatre course that I still remember. AL: Tell us how you became interested in your field? SB: When I entered college, I wasn't sure whether I would pursue engineering, physics or mathematics. I took a freshman program of various courses, but the calculus course drew me in. I was told that I was the first student in some time (maybe ever) to get a perfect mark in the freshman calculus course I took. I was drawn to study math ("pure" math as it was referred to then) and I got Bachelor, Master and PhD in math. My PhD thesis was in point-set and set-theoretic topology. I have an older brother who was studying actuarial math and he encouraged me to take SOA exams to help with getting summer jobs. That got me a good actuarial intern job. When I was a graduate student, I was able to get good paying jobs as a professional singer. At the time that was more fun than an actuarial internship. When I finished my PhD and was looking for an academic position in my area of theoretical math, I became aware of the need for academics in the actuarial area. I was an ASA not long after finishing my PhD and I considered leaving academia for a job as an actuary in industry, following in my brother's footsteps. My love of the academic life kept me pursuing an academic career and the academic opportunities in the actuarial program were more attractive than in the "pure" math direction. I had the appropriate background, and took a job at the University of Texas at Austin as an Assistant Professor of Actuarial Science. A couple of years later, 1980 to be exact, the University of Toronto made me and offer I couldn't refuse, and I have been at U of T (of the north) ever since. AL: What do you like least and most about writing books? SB: What I like least about writing books is feeling guilty when I miss deadlines for completion (which I almost always do). I also am not very good with graphics programs. It is time consuming to make good graphs, and, for me, it is very time consuming to make mediocre graphs. Another thing I dislike is the re- and re-re and re-re-re-reading when the final version of a book is being prepared. What I like most about writing is the freedom to include and expand upon what I feel is important. It is also very gratifying to include concepts, approaches and examples that I feel are innovative and useful to the reader. AL: If you could write a fiction book, what would be its title? AL: What advice would you give to young actuarial students to help them in their future endeavors? SB: I encourage students to be systematic in the way they approach learning a subject. The time constraint inherent in professional exams requires a student to be able to assess questions quickly. An important part of preparation for exams is working through as many exam-type problems as possible. Repetition and rote can be helpful in building up speed. It is also true that employers are looking for people who can do more than pass exams. Good communication skills have become an essential component of a student's overall makeup, and I strongly encourage students to do whatever they can to develop those skills. AL: How can readers learn more about you and your work? SB: My "math" website is www.sambroverman.com, but it is somewhat out of date. My music website is up to date, www.brovermusic.com. There are tracks from my CDs there, as well as other information and links to videos. ACTEX publishes some of my books and distributes all of the others. AL: Can you share any other current work you'd like to talk about? What can we look forward to in the future from you? SB: I have recorded a CD of math parody songs that will be given out to those attending the annual Actuarial Research Conference in Toronto in August, 2015. I have a sabbatical year coming up and I am thinking of writing an MFE related book or study guide during that time. In " ACTEX News, Actuarial Career, Actuarial Exams "
In " ACTEX News, Actuarial Career, Webinar "
In " ACTEX News, Actuarial Career, Uncategorized, Webinar "
ACTEX Learning's mission is to help actuaries and actuarial science students pass exams and achieve success in their careers. Over 50,000 self-study students as well as colleges, universities, and corporations have relied on ACTEX for actuarial exam prep, study materials, learning tools and professional development.